How To Plan A Daily Quiet Time With God briefly summarises what you can do on a daily basis to recapture the intimacy of communion with Jesus Christ. When I first became a Christian, I was encouraged by my church family to plan a daily Quiet Time with God. 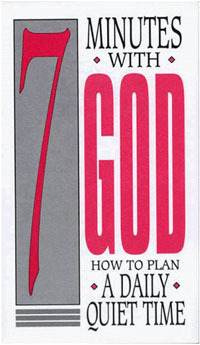 I was given a little booklet called Seven Minutes With God by Robert D. Foster. Robert Foster explained how several college students in the late 19th Century coined a phrase that encouraged them to plan a daily quiet time. The phrase was: Remember The Morning Watch. By following the morning watch, these students had recaptured the intimacy of communion with Jesus Christ. The morning watch inspired these students to greater levels of commitment to the work of God in missions. "A remarkable period of religious blessing followed and culminated in the departure of the Cambridge Seven, a band of prominent athletes and men of wealth and education, for missionary service. They gave up everything to go out to China for Christ." Hudson Taylor said, "You don't tune up the instruments after the concert is over. That's stupid. it's logical to tune them up before you start. Psalm 5:3 says, "Morning by morning, O Lord, you hear my voice; morning by morning I lay my requests before you and wait in expectation." After reading Seven Minutes With God, being challenged by Hudson Taylor's commmitment to the morning watch and reading Bible verses like Psalm 5:3, I was convinced that I needed to Remember The Morning Watch! I discover that there were many ways to plan a daily quiet time with God. After reading several books on the subject, I noticed that they included three important segments. Preparation is the key to doing things well regardless of what we are doing. It is the same when it comes to planning a daily Quiet Time with God. Preparation is about preparing your heart in order to hear from God. It means you need to cleanse your heart of sin so that there are no hindrances or barriers between you and God. The purpose of a daily Quiet Time with God is to hear from God. To hear from God, you will need to read the word of God. "All Scripture is God-breathed and is useful for teaching, rebuking, correcting and training in righteousness, so that the servant of God may be thoroughly equipped for every good work" (2 Timothy 3:16-17). When you read God's word, you will hear God speaking to you. God's word speaks to you in order to teach you, rebuke you, to correct you and to train you in righteous living. God's word reveals many principles and truths for life. In fact, many people say that God's word is a manual for life. Therefore, it is paramount that you pray about these principles and truths that God reveals to you in your daily Quiet Times. If God speaks to you about forgiveness, you need to pray it through. If God speaks to you about a specific area of your life, you need to ask God to bring that about in your life. Prayer enables you to talk to God about the things God talks to you. Often people simply see prayer as asking God for things. However, prayer is more than asking God for things. The ACTS acronym reminds you that prayer involves adoration, confession, thanksgiving and supplication. Adoration - Adoration is taking time to voice God's greatness, goodness, power, majesty and sovereignty in prayer. Confession - Confession is about acknowledging your weaknesses and sins before God with the desire to make sure that every sin is cleansed and forsaken. As the Bible says, "If we confess our sins, He is faithful and just to forgive us our sins and to cleanse us from all unrighteousness" (1 John 1:9). Confessing sin is very important because "If we regard iniquity in our hearts, the Lord will not hear us" (Psalm 66:18). Confession allows for a clean slate so that you can enjoy your time with God each day. Thanksgiving - Expressing your gratitude to God in prayer is what thanksgiving is all about. The Bible encourages you to give thanks in everything, for this is the will of God in Christ concerning you (1 Thessalonians 5:18). Thanksgiving is simply verbalizing all that God has done for you. There are so many things to thank God for: life, family, friends, etc. etc. Supplication - The Bible says, "Be anxious for nothing, but in everything by prayer and supplication, with thanksgiving, let your requests be made known to God; and the peace of God, which surpasses all understanding, will guard your hearts and minds through Christ Jesus" (Philippians 4:6-7). Bringing your petitions before God is supplication. It means talking to God about your needs and the needs of others. The Bible encourages you to pray for one another. You may want to make known to God the needs of your family, your neighbors, your church, etc. etc. etc. Remember The Morning Watch is a decision only you can make. 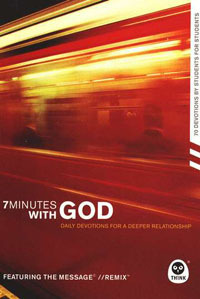 If you need more information, then 7 Minutes With God - Daily Devotions For a Deeper Relationship is for you.